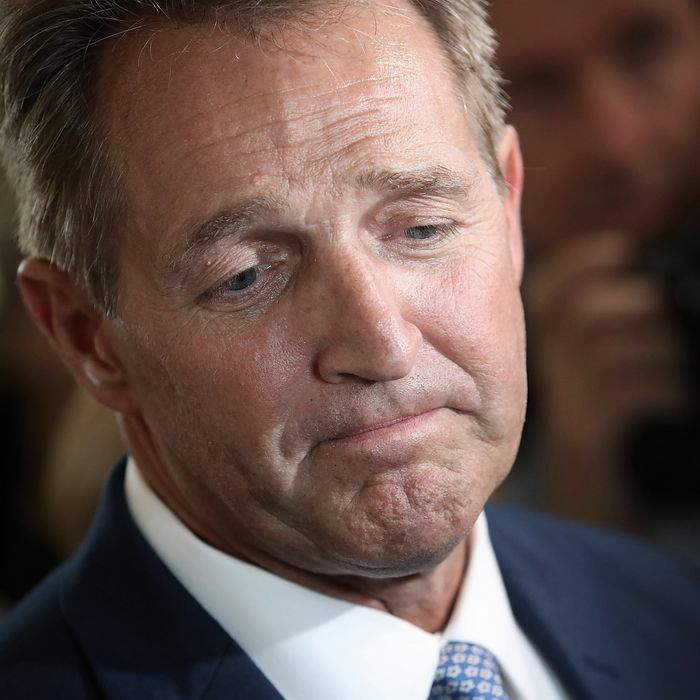 Jeff Flake wasn’t outflanked by Trump supporters in the GOP. His own “true conservatives” defected. Jeff Flake didn’t just decide to forego campaigning for reelection simply to exercise the Conscience of a Conservative without political distractions. He abandoned his 2018 reelection campaign mostly because his odds of surviving a GOP primary were dismal. It is clear at this moment that a traditional conservative who believes in limited government and free markets, who is devoted to free trade, and who is pro-immigration, has a narrower and narrower path to nomination in the Republican party — the party that for so long has defined itself by belief in those things. It is also clear to me for the moment we have given in or given up on those core principles in favor of the more viscerally satisfying anger and resentment. But the more you look at today’s Republican coalition, the more it appears that the GOP wasn’t taken away from “true conservatives”: True conservatives have defected to Trump. Core Conservatives are deeply skeptical of the social safety net and favor lower tax rates on corporations and high-income individuals. While they are divided on whether immigrants do more to strengthen or burden the country, Core Conservatives offer far more positive views of immigrants than do Country First Conservatives. Core Conservatives are relatively upbeat about national conditions and a majority says that the United States “stands above” all other nations in the world. [H]ighly critical of immigration and U.S. global involvement. Country First Conservatives are most likely to describe immigrants as a burden on the country and to say that too much openness threatens American identity. More than any other group, they say that America should act in its own interest even when its foreign allies disagree. So what do these two types of Republican constituency groups think of Donald Trump’s job performance as president? As you’d expect, the Country First Conservatives are big Trump fans, with 84 percent giving him a positive job evaluation and 71 percent approving of him strongly. But Flake’s people, the Core Conservatives, like the job Trump is doing even more, with 93 percent approving and an incredible 80 percent approving strongly. Flake hasn’t been outflanked or even outgunned within the Republican Party: He’s lost his kind of people — Barry Goldwater’s kind of people, Ronald Reagan’s kind of people — to Donald Trump. Perhaps he can get them back, but it’s not happening automatically or anytime soon.